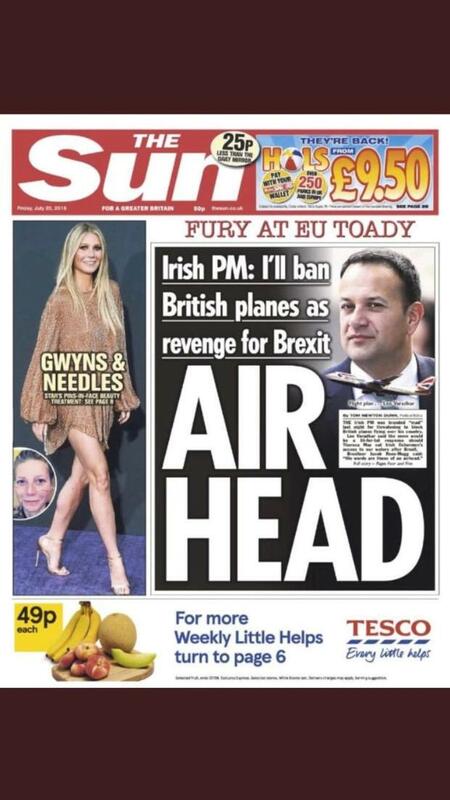 TAOISEACH Leo Varadkar has insisted he was not offended by a UK tabloid calling him an EU “toady” and “an airhead” in a dramatic escalation of the war of words over Brexit. Mr Varadkar, speaking in Drinagh, Co Cork, laughed at the suggestion he would be upset by the UK tabloid, The Sun, insulting him over a position on Brexit which is critical to Ireland and the domestic economy. “No, I don’t get bothered about what appears in British tabloids,” he said. “I am always of the view that if somebody engages in name calling it is probably because they don’t want to talk about the substance. “I am not the slightest bit concerned about some of that language that we are seeing coming out of London. “What matters really is what happens between the Governments – the 27 Governments of the EU, the institutions (and the UK). “That is all very grown up and civilised. Mr Varadkar also moved to dampen speculation that the UK is unavoidably on source to crash out of the EU without an exit deal. That was despite Prime Minister Theresa May warning it was the EU – and not the UK – which needed to evolve its Brexit position. Mrs May warned the proposed back stop agreement to protect Northern Ireland-Ireland trade was unacceptable as it was currently detailed – as she flatly ruled out the free trade deal on offer, warning that it effectively created a border between Northern Ireland and the rest of the EU. The British leader also stressed that Northern Ireland was “an integral part” of the UK. But the Taoiseach said he firmly believed a Brexit deal between London, Brussels and Dublin would be agreed. “I am very confident that we will avoid a ‘no deal’ hard Brexit scenario,” he said. “But if we are going to come up with a solution, a withdrawal agreement with a transition period with a framework for a new relationship with a back-stop (for Northern Ireland), time is short,” he warned. “It is not a solution but I do think it can input into talks,” he said.